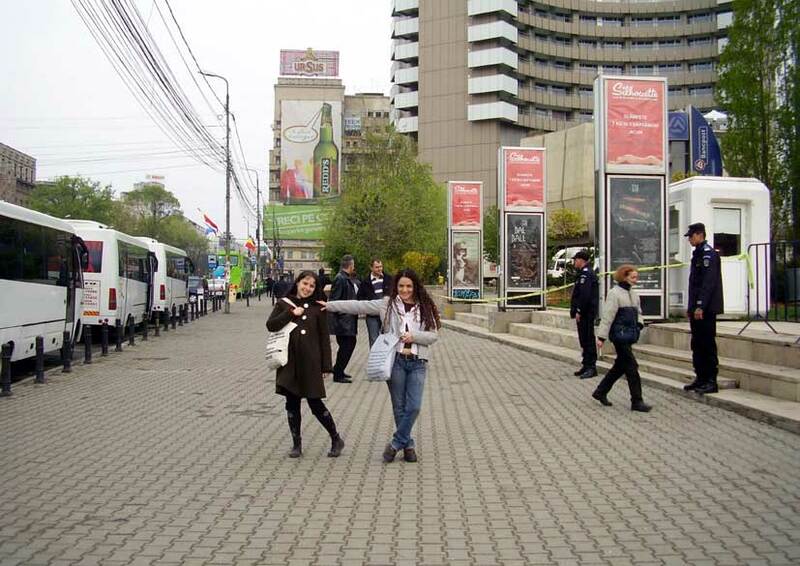 Between 2-4 of April 2008, a NATO summit took place in Bucharest. The attempts to react to this summit or to use it as an occasion to bring into a public discussion subjects as war, stability and peace keeping missions in the context of global capitalism were the subject of intense monitoring and control from the part of the state. 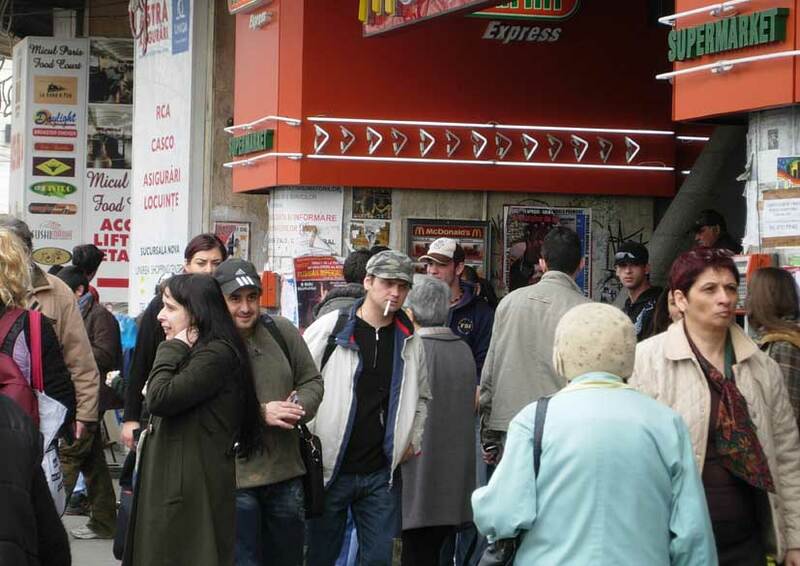 An atmosphere of terror was created, starting weeks before the summit, through different means, like the mass-media campaign that constructed an image of the "dangerous anarchists" that will destroy the city and our image of nice, obeying country, like the denial of entry at the border to people on the reason that they had on them flyers against NATO and against violence, like the harassment of the people involved in organizing some form of protest and also of their families and friends, like the surveillance of phones and internet activity made official and legal, etc. 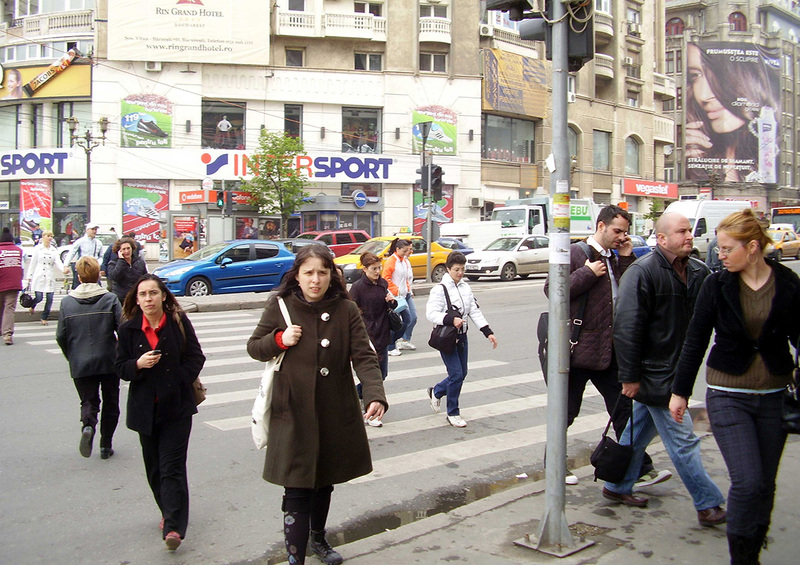 Different rules and regulations were specially created for the occasion of the summit, interfering with the everyday life of Bucharest. People were detained by police just for looking like “anarchists”, for carrying heavy bags with them, for walking around in bigger groups. The city of Bucharest was cleansed of everything that may interfere with our image of nice, „European” country (from the removal of homeless people from its streets, people who were forcefully sent to “shelters” in the middle of nowhere, to the gathering of the stray dogs that were picked up from the streets and kept in shelters only to be sent back to the streets immediately the summit ended and to the intention to stop any form of resistance and protest, no matter how peaceful or discreet). Despite all these forms of intimidation and control, some people did organise and did find ways to state their opposition to war and militarization. 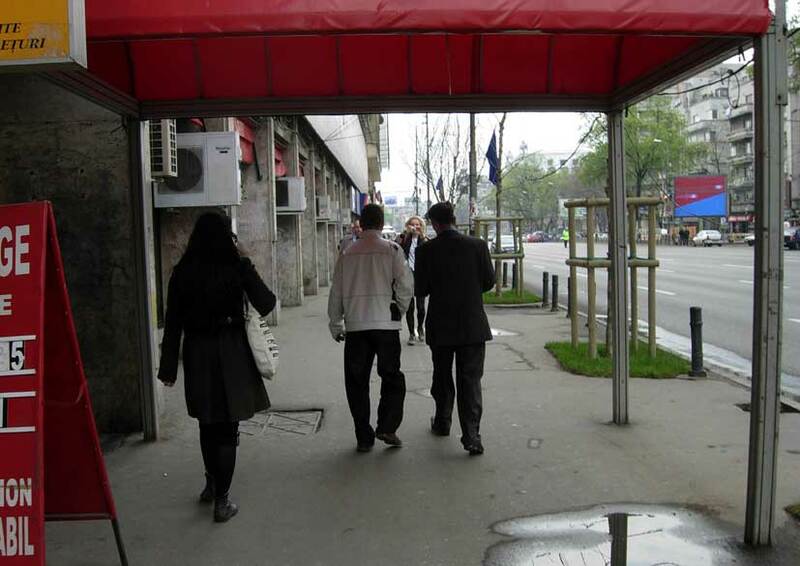 A space was rented in Bucharest as a place for discussion, workshops, screenings. On the 2nd of April, the first day of summit, the riot police entered this space, they beat up people and they arrested everybody inside without any legal basis, just on the presumption that "something might happen". Later on that day, they had to release everybody, as a consequence of the interventions of human rights groups and of people piqueting the police stations. This abusive action from the part of the police created the conditions in which some forms of protest became possible. Quiet marches were organised through the city. 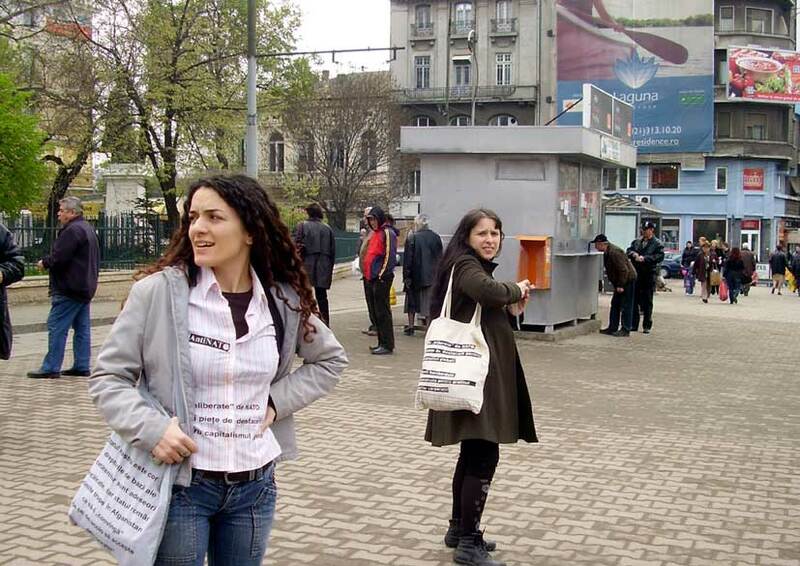 Having a constant interest in finding small, everyday, unpretentious strategies and models for resistance, we had planned to walk around in Bucharest wearing clothing with some simple, clear statements written on them, statements making the connection between war and violence on the one side and profit and capital on the other. In the conditions in which to express your citizen right to the freedom of speech would automatically make you a “terrorist”, we wanted to do these simple, everyday actions of taking a walk, window shopping and making tourist photos, by these questioning the association between violence and protest, association that was so elaborately constructed. The fact that on the 4th of April, we were able to have a long walk through the center of Bucharest, wearing our anti NATO messages and without being detained by the police, was made possible by the people taking action before us (since the first day of the summit) in spite of the fact that they were subjected to the abuses of the police. In 1975, Romanian artist Ion Grigorescu clandestinely took photos in one of the so-called “spontaneous” electoral meeting for Nicolae Ceau?escu, meeting strictly controlled by the infiltrated members of the Securitate  . The disturbing presence of these observers is symbolical for the constant surveillance that was an essential feature of Ceau?escu’s totalitarian regime. 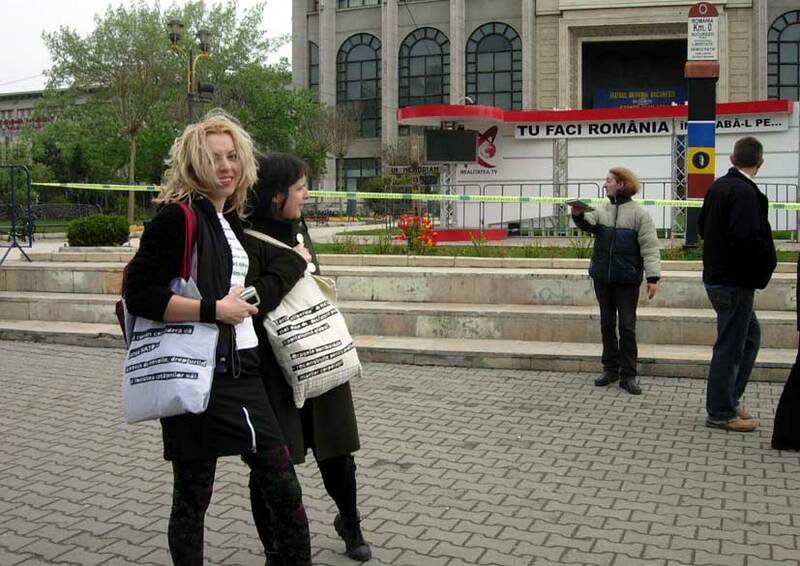 During our walk through Bucharest (same as on the entire period of the summit and also on our way back to our town, Timi?oara) we were constantly observed by members of the secret police. 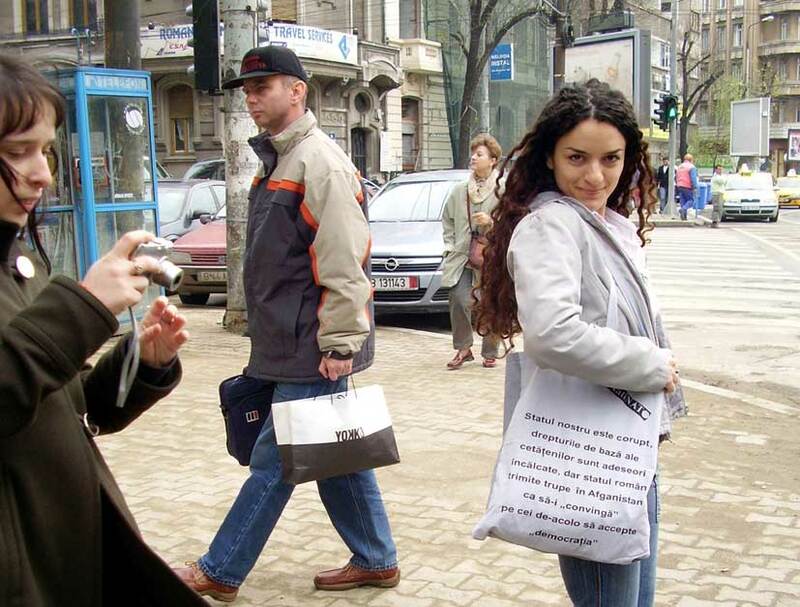 They appear in the photos that we took of ourselves on the sunny streets of Bucharest, anonymous, mixed with the regular people. Taking these photos was also our mean of reacting with some form of observing to their constant observing. 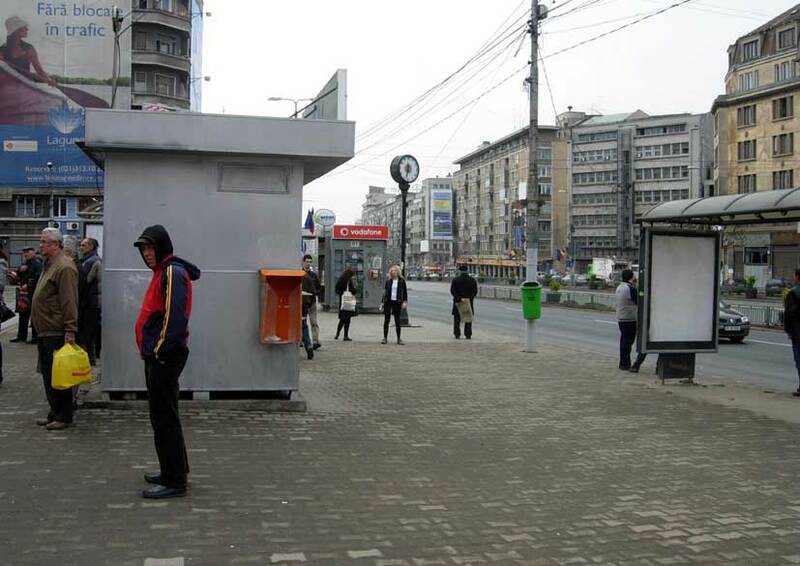 One of the main critiques of Romanian communism is constructed exactly in relation to this constant surveillance, to the fact that you could not trust anybody and that all your moves and all your words were unceasingly observed. Now, when in our country any idea of the left is so righteously condemned as "totalitarian" and "communist" with the purpose to reinforce capitalism even more, as the only possible alternative, the constant surveillance and control is still part of the everyday life. It is enough to state publicly your opinions, to try to have some sort of critical stance towards the way Romania is on now, and you will be subjected to the same sort of surveillance as before 1989, even if now we are living the "freedom" times of capitalism.